Today Ireland elected Michael D Higgins as president. Higgins, who lived and worked in America 40 years ago, is the most anti-American president Ireland has ever had. As an American living in Ireland it has been clear to me that since the early 1980s Higgins has been among the most outspoken opponents of American policy in Ireland. He's been at the forefront of organized protests and rallies directed at America for 30 years. In the 1980s it was President Reagan that riled Higgins. 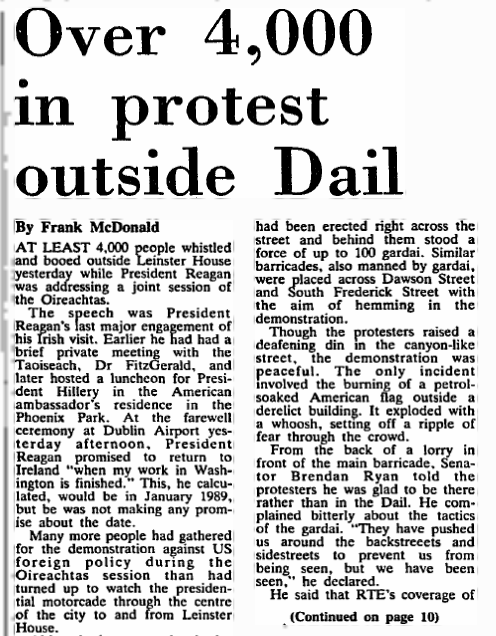 During Reagan's short visit in June 1984 Higgins was a keen participant in the protests against Reagan at Shannon Airport, in Galway and then outside the Dáil (parliament) in Dublin when Reagan was speaking there. During the 90s Higgins was opposed to the Gulf War and opposed various aspects of America's defense policies during the Clinton years. Flash-forward to the Bush years. In the run-up to the Iraq war, Higgins was with the majority of Irish people in opposing the war, but he went further than most here when he declared that the American military was going to "wage war on a civilian population." Visions of American war crimes came easily to him. 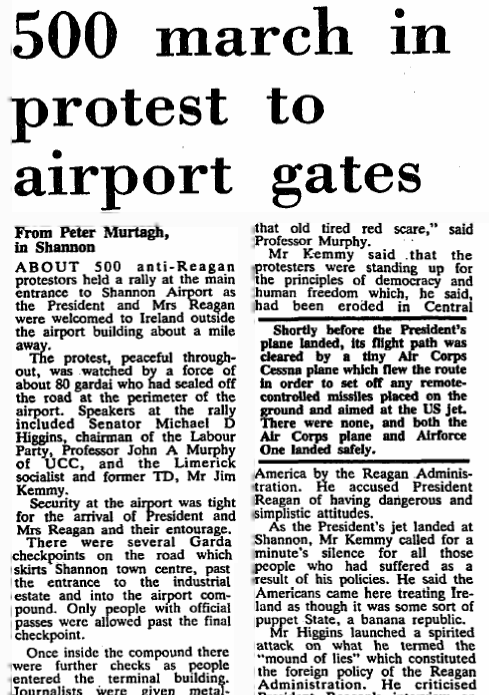 When the fighting started he denounced the Irish government's policy on allowing American troop planes to land and refuel at Shannon. While he hasn't been a fan of a number of America's presidents, he has allied himself with some of America's enemies. He has been an admirer of Fidel Castro's regime in Cuba, cited Castro favorably in the Dáil and simultaneously demanded that America lift its embargo on trade with Cuba. He also courted Sandinista leader Daniel Ortega. 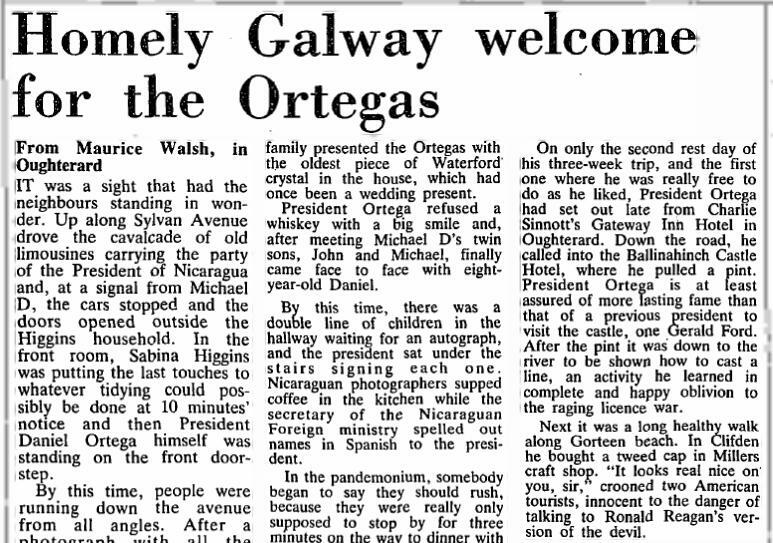 Higgins was also a supporter of the Sandinista revolution in Nicaragua and in 1989 he hosted Nicaragua's Sandinista President Daniel Ortega in his own home. In early 2003 he visited Iraq in order to get the Baathist perspective before the war had begun. In 2004 he took part in a candlelight vigil to mourn the death of Yasser Arafat. Before you worry that Ireland has gone off the deep end with Higgins, there are a few caveats: (1) a majority of people were totally dissatisfied with options on offer during the election and Higgins' win was more a rejection of the others and an embrace of him and his views; (2) Higgins only polled around a third of the electorate, but gained a majority on transfers from the other candidates; and (3) the position he's won is mostly ceremonial with no influence on policy. The last factor should mean that if Higgins does his job properly we'll hardly notice that he's in office during the next seven years. Higgins' is entitled to his views, which are to the left of the Irish population, but as President he's not in a position to make or even influence policy so his views shouldn't matter. Yet, over the past 20 years Presidents Robinson and McAleese have managed to expand the role of the office beyond what was ever imagined when the constitution was first passed in 1937. One of the new roles of the President is leading trade and cultural delegations on trips abroad. Mary McAleese has made many such visits to different parts of America, where she never put a foot wrong. Will Higgins be able to follow suit? I'm doubtful. If Higgins were to go on a visit to America he would have to temper his reactions to those who hold opposing views to his. I'm not sure he can do this. Last year Higgins turned the air blue during what had been a robust, but good-natured live radio debate between himself and Boston talk show host Michael Graham. The discussion ranged over a number of topics and Higgins got more and more wound up. Eventually he went off on Graham, urging him to support a national health care initiative for America and to "be proud to be a decent American rather than just a w****r". Whatever you may think of Graham's views they are not outside the American mainstream and Higgins couldn't cope with them. The government would do well to take heed of Higgins' contempt for some aspects of the American people. An explosion like the one at Graham during a trade mission might cause the kind of upset that would drive potential jobs away from Ireland. In addition, his views on Israel might cause consternation in other quarters. Overall, it would probably be a good thing if the next seven years did not include any Irish presidential visit to America.